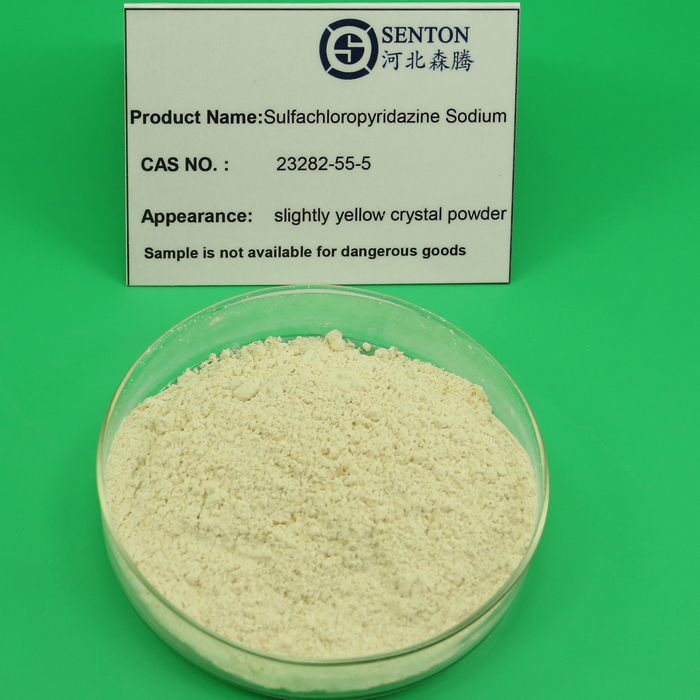 Effective Insecticide Sulfachloropyrazine Sodium is white or yellowish powder antibacterial.As an antiphlogistic drug for fowls and animals,this product is mainly used to treat coliform, staphylococcus infection of chickens, and it is also used to treat whitened cockscomb, cholera, typhoid etc infection of chickens.It has No Toxicity Against Mammals.It is mainly used in the treatment of explosive coccidiosis of sheep, chickens, ducks, rabbit and be used in the treatment of fowl cholera and typhoid fever. HEBEI SENTON is a professional international trading company in Shijiazhuang, China. Major business include Agrochemicals, API & Intermediates and Basic chemicals. Relying on long-term partner and our team, we are committed to providing the most suitable products and the best services to meet the customers` evolving needs.While we are operating this product, our company is still operating on other products, such as Antiparasitic Drugs,Mosquito Larvae Killer,White Azamethiphos Powder, Fruit Trees Great Quality Insecticide, Quick Efficacy Insecticide Cypermethrin, Yellow Clear Methoprene Liquid and so on. Looking for ideal Effective Insecticide Sulfachloropyrazine Manufacturer & supplier ? We have a wide selection at great prices to help you get creative. All the White or Yellow Powder are quality guaranteed. We are China Origin Factory of Treatment of Explosive Coccidiosis. If you have any question, please feel free to contact us.